This blog will give you the brief idea about all the things that I know. 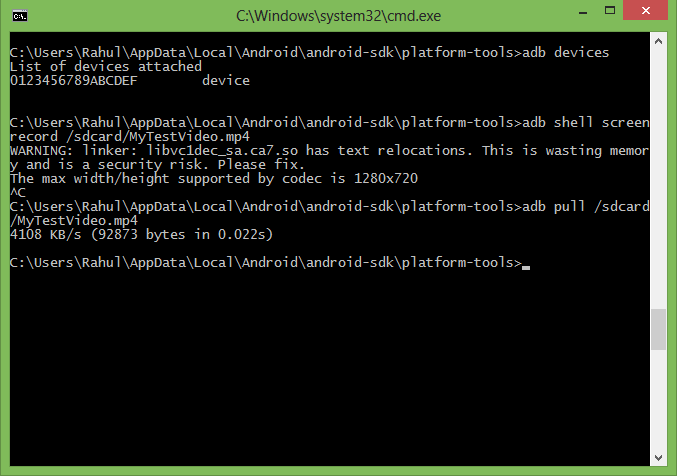 In your android device go to “Settings” -> “Developer options” and tick “USB debugging options”. Then connect your device to computer which has adb in it. Go to the directory in which adb is present and open a command line window there by pressing “shift + mouse right click” and select the option “Open command window here”. Now go to your gallery and check out your recorded video. "developer options" -> tick the "Show touches" options present under INPUT category.